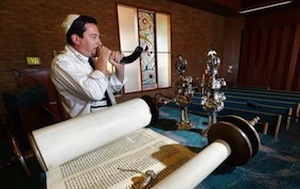 One hundred blasts of the shofar, or ram’s horn, will mark the start of Rosh Hashanah – the Jewish new year – on Thursday. One final blast will conclude Yom Kippur, the holiest day in the Jewish year, on Sept. 14. The High Holy Days also are called the 10 Days of Awe, a time when Jews around the world will focus on their mistakes of the past year – with others and with God – and ask for forgiveness and seek reconciliation before God closes his book of life for another year. It ends with a 25-hour fast before the shofar blows a final time.